Winter is dark and cold — at least where I live. I can’t do much about the cold, however, I can do something about the dark! The long nights of the winter are a perfect time for luminaries. Who doesn’t love the inviting look of a walkway lined with lights? My mom sent me this product link after seeing it in a local garden store. I loved it! 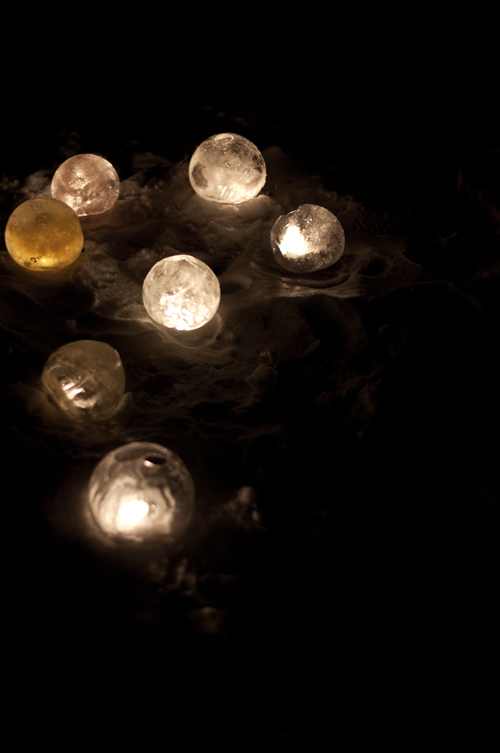 It reminded me of this pin and, with a little DIY-ing, I figured out a way to make them into outdoor luminaries. The light source is your choice — small click lights or candles — and with a few other simple materials, your winter can be a little less dark too. It’s so easy you’ll want to make a bunch! – Balloons – any size – Huge ones would be awesome! 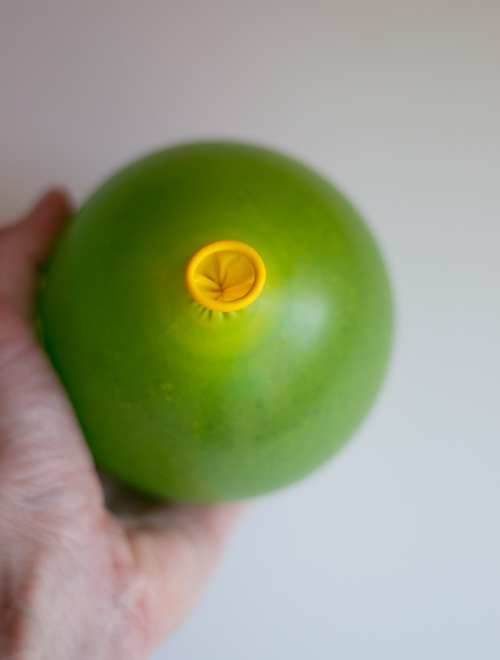 To begin, if you want to add color, add a few drops of dye inside the balloon. For very dense, deep coloring, add more than a few drops. 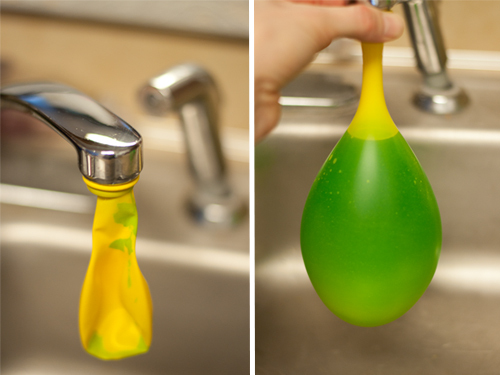 Attach to a water faucet and slowly fill the balloon with water. Fill to your desired amount. 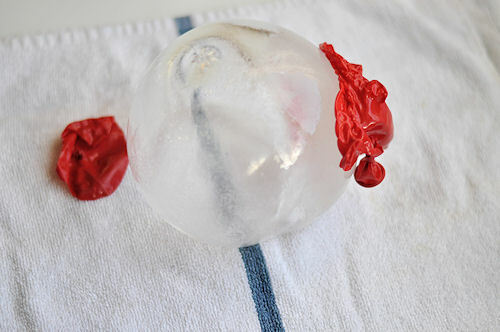 Be careful of overfilling, especially if there is dye involved that could stain if the balloon bursts. Freeze. There are two freezing techniques — use the first for click lights and the second if you’re using candles. 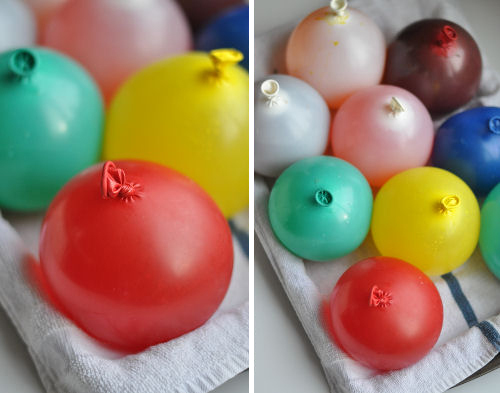 Completely freeze the balloons. It is freezing cold here so I was able to plop my outside. I placed them on a cookie sheet to keep them semi-contained. Once frozen, remove the balloon. Scoop out a little divot in the snow, place the click light inside and place the ice luminary on top. The click light version is nice for bright, non-extinguishable light. Obsessively Frequently check on them while they freeze. Allow the water in the balloons to mostly freeze. 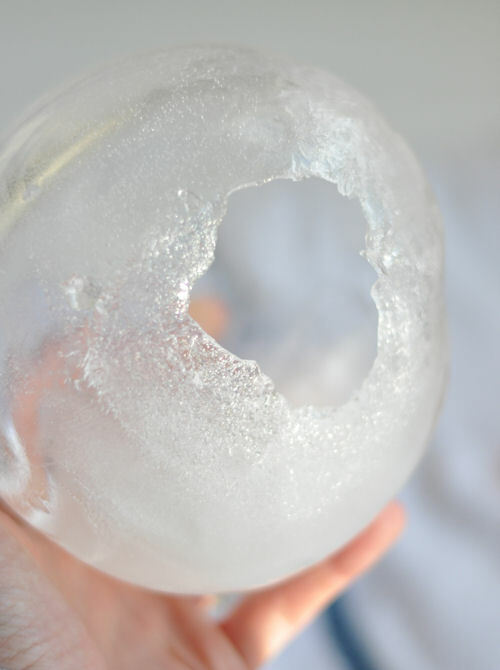 When the outer shell is frozen but the inside is still water, cut away the balloon and release the water. You may have to carefully break the bottom open to release the water. Do this outside, in a sink or over a bucket so the water doesn’t stain. Don’t have snow? 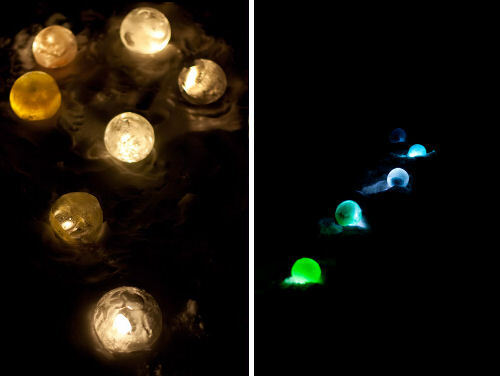 This method works great for non-snow areas like deck railings, with click lights or candles. Once the water is removed, continue to freeze the ice globes. While it requires more fiddling and the flames can be easily extinguished by wind or melting ice, I think I prefer the soft light of candles. Either way, icy light makes the winter dark less so! Those are brilliant. It’s freezing outside with lots (for England) of snow. I think I know how to occupy myself (and maybe a child or three) if there’s a snow day in our future. We made the ice marbles just to add colour to our front lawn. We had some problems freezing them because all the snow acted as an insulator. I really like the night time version – I’ll have to go back and add a couple of click lights. Thanks! This is an amazing idea! It’s cold and gloomy here (Kansas) and I’ve been missing the glittering lights of Christmas. This will look wonderful lining our walk when we have company over for our Super Bowl party. Pinning! This post took my breath away because they are so pretty and that this could be my own lawn!! We make these like crazy and in variations, up here in the north, too. (Sweden) I adore Gabrielle/designmom and am happy to find a shared love here! 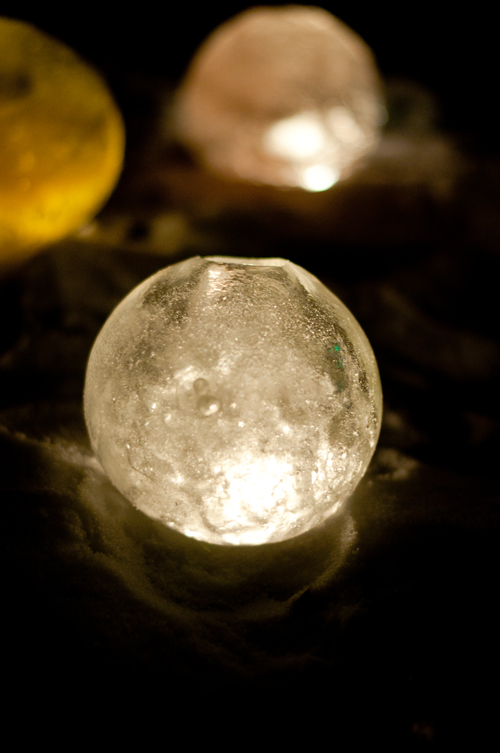 Aren’t ice lanterns are truly this beautiful and we all — kids and myself — love keeping them in supply. 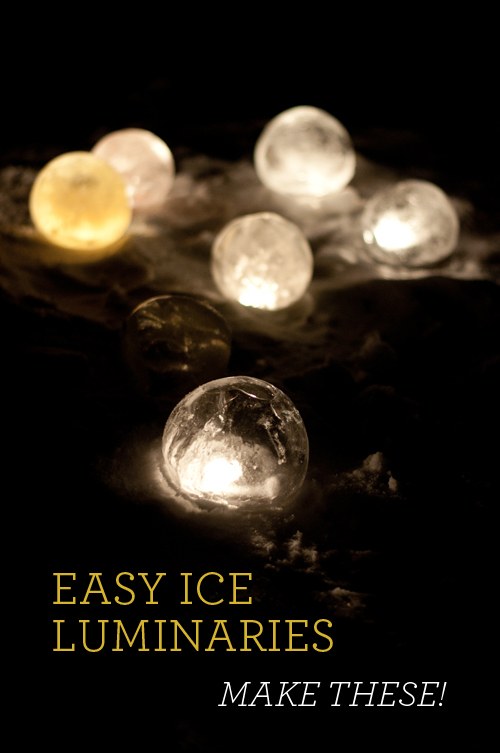 Ice luminaries are a brilliant idea, especially with the freezing weather arriving in Boston this week. The question is: which light source do I choose? There’s something ethereal about the melt-away candle version but my boys might not appreciate their project’s disappearance… Either way, thank you!! … we’re commenting at about the same time on these pretties! I couldn’t resist a response at the mention of ” boys” — I’m another reader (www.willowday) not designmom but, I wanted to add that we’re experienced ice lanterns makers (and we make them all winter) that I much prefer the look of tea light candles and with heat rising, we’ve have never had our ice lanterns melt away. The beauty with these is so two fold, our boys love to keep us in supply and we love the magic they create. 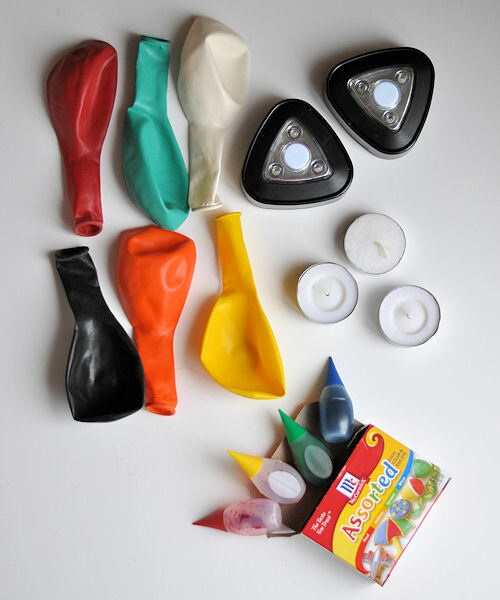 From our household’s experience, if you’re really worried about these being too delicate, freeze some lanterns solid (into sculptures) and alternate them in within your other “ice lanterns” which have the candle. This trick has worked great for us! Last, if you want one that lasts and lasts and lasts, a deep sand bucket can really be a robust beauty. Although we live in Sweden, with a long winter for these; we’ve made them in the Autumn and they last long enough for a start of a party and I’ve had readers who’ve mailed me photos of these used at indoor diners! I hope you have the chance, too! Wow, this is so pretty! What a fun project, Amy. Thank you! love this! I’d seen a photo but not a tutorial. thanks for sharing! This is a really great idea. I’d never thought of putting a click light inside the ice. Perfect project for a day like today when we’re having a late start to school because it’s -23 with the wind chill! You have the perfect weather for these! I love this!! Such a great, wonderful, and fun idea!! And so pretty, too. This is really pretty and I may try it! It is sooooo cold in Michigan right now! These are amazingly beautiful but I’m so glad that I don’t live in a place where I can make them! Wildly Original linky party Opens every Wednesday evening. These are like baby Finnish Ice Lanterns. I grew up in a town with a huge first generation Finnish population and they use to make these in the winter for their loved ones. It’s a tradition to put one out for each family member that has died or put one on their plot at the cemetery. These are much cheerier! What a lovely way to commemorate loved ones that have passed. Clever and beautiful! I pinned this. This is fantastic! gorgeous! Unfortunatly we don’t live somewhere cold enough. At least not very often. but when it does, I want to try it! i just love this. i tried a similar idea a few years ago. i used card board orange juice cartons filled with water, set a can filled with rocks or sand in the water and let freeze. tear the carton off when frozen, pour hot water in the the can to remove it and you can set outside with your candles inside. It is hot out here (Southern California). Any way to make this without packing in snow? Pop them in the deep freeze! This looks so absolutely beautiful! I love the one with clicklights more. Have to remember this for next winter (hope there won#t be any more cold days this winter :-) ). Even with below freezing temps and a bit of snow on the ground, I did not get frozen balls, disappointed. Hmm, put them in my deep freeze. WhaHoo! Wow these are beautiful! I can imagine that it is really comfortable to light the luminaries on a cold winter night when you sit with a blanked on a couch sipping a hot chocolate. I love how your luminaries turned out, so pretty looking!! I’m saving these and I’ve got this linked to my DIY luminaries post too today – thanks for your tutorial! “It place China in the worldwide news and fired up admirers back family home,” Duerden mentioned with the duo’s shift to Shanghai final 12 months.David Beckham was a significant determine in London’s travel to win internet hosting legal rights for your 2012 Olympics, and now the sports icon is taking over the problem of boosting the impression of China’s troubled soccer community. I’m in the U.S. in Iowa (which is really cold in the winter). I’d like to try these, but I’d like to try the click lights. What are click lights????? Where do you purchase click lights???? Where ever they sell light stuff. Love this! I’m in Canada so the weather is defiantely cooperating (-20 C today). I could make these and they would stay frozen all winter (3+ months). I run a dayhome and the kids would love to make tons of these. But I hate the idea of having to turn the click lights on and off every evening…or of leaving them on and wasting expensive batteries. Also not a fan of having to light and put out a candle every evening. Has anyone tried this successfully with outdoor xmas lights? 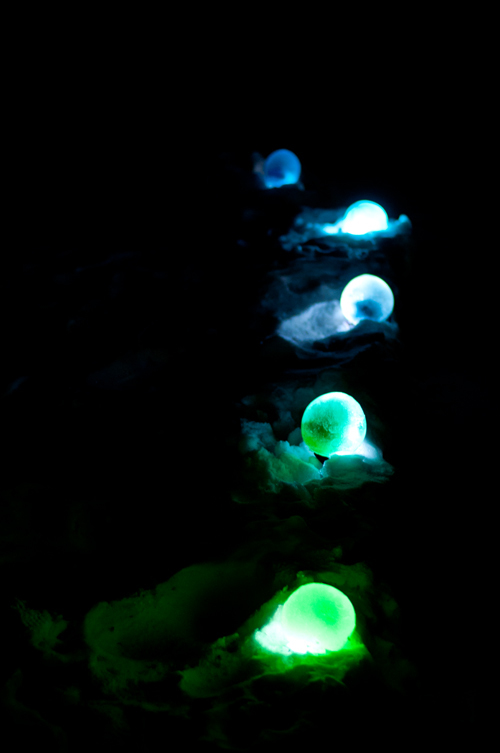 Or solar garden lights? Any suggestions would be great. Love it. I will do it, but what do you do with all the balloons afterwards? Love this idea! How long do the click lights last in cold weather? Do you turn them on and off or jut leave them on all the time?